Home More Professionals Why Milind Soman Is The Much Needed Role Model For Indian Fitness? One of the very first hottest and appealing supermodels in India, MILIND SOMAN!! 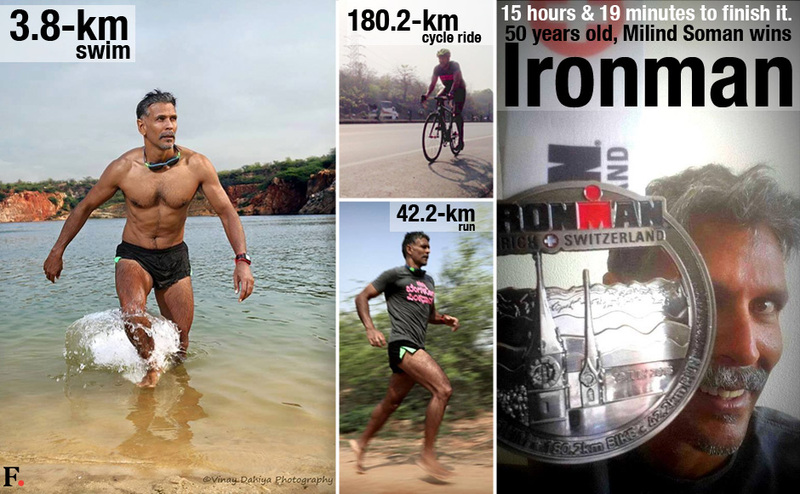 Milind has added several colourful feathers of titles in his hat from being a Supermodel to a Television and Silver Screen Actor to a Producer and to being known as the Ironman – running a triathlon at the age of 50. Success comes to those who sail through the downtimes and up and Milind Soman is the perfect example of toughness and attractiveness. I had completely forgotten this man until I heard he had started an incredible journey of running 1,500 kilometres from New Delhi to Mumbai in 30 days and that’s when I actually began surfing through the internet to find out more about his life story.You may wonder if I am going to share his story with you but that’s not what I am going to do. In fact I am going to share with you Three Interesting things we all must learn from Milind Soman. Every man is gifted with a unique set of capabilities but there are very few like Milind Soman who accept the challenges of pursuing a typical approach and make their way through the oddities & monotony of society and life. Of course we love him for his good looks and lean body but that’s just secondary. Recently, Milind ran a marathon from Ahmedabad to Mumbai, barefoot, to raise awareness for women’s health in the society. Women are known for being physically fragile because of the various transitions her body undergoes right from her teens to thirties, pregnancy and later the menopause phase and the list goes on. This man organized an initiative by the name Pinkathon where he invited women to run for their health. Now if you ask me, I can’t think up of a public figure who has gone beyond ‘speaking’ about Women Empowerment and Well being, can you? We live in a world where ageing is the most dreaded state of life and is treated as nothing less than an incurable disease. I mean come on why is it such a big deal? We aren’t eternal and with that said, why not grow into your years in elegance and grace. Regardless of whether you’ve completed 25 Years of your life or are stepping into your 50s this man is a perfect personification of the saying, ‘Age is just a Number’. Taking care of your Fitness and Health is a trump card to ageing confidently so if you ever feel disheartened about growing a year older than you are then have a look at one of the World’s Sexiest Men – Milind Soman. “It is not normal to break stereotypes but it takes a dream and unparalleled dedication to achieve your dream. Everyone is afraid of breaking the conventions set by the society, but it takes substance to push yourself out of your comfort zone and achieve your dreams.